1. USB pass through support was brought in with ESX 4.1, so make sure your Host machine is 4.1 or newer. 2. Also the “Hardware Version” of the virtual machine itself must be (at least) version 7. 3. 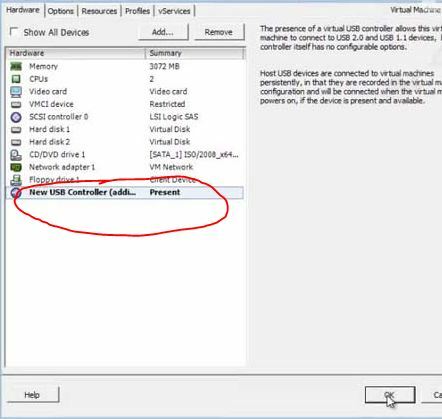 Your first task is to add a “USB Controller” the the VM. (You will need to power the VM down before you can do this). Edit Settings > Hardware Tab > Add. 4. Select USB Controller from the list > Next > Next > Finish. 6. Start up the VM. 7. Once you have a USB controller, you can present the USB devices that are connected to the Host ESX server. 9. You will now see “USB device” as an option > Next. 10. Now you can see the USB devices that are connected to the Host (In this case an HP UPS) > Select your device > Next > Finish > OK. 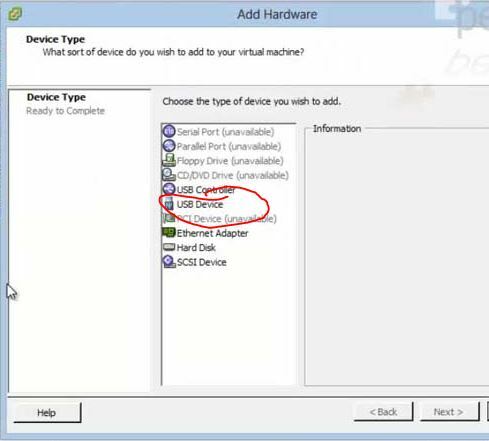 Note: The option “Support vMotion while device is connected” option will do exactly as is suggests, if the VM is vMotioned to another Host, the USB device will remain connected to this VM. (That is very cool if you think about what it has to do to make that happen). 11. The first time you boot into the operating system, (In this case Server 2008 R2) it will detect the hardware, here I’m opening Device Manager. 12. And you can see the USB controller, it will need a reboot before it starts them with the correct drivers. 13. Post reboot, the USB controller and devices will load, and be connected successfully. Note: After this you can simply add and remove USB devices, without the need for any downtime. 14. Now in Device Manager everything looks a lot healthier.